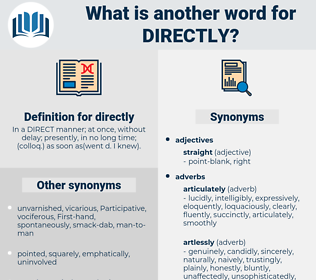 What is another word for directly? In a DIRECT manner; at once, without delay; presently, in no long time; ( colloq.) as soon as( went d. I knew). forthrightly, specifically, explicitly, exactly, precisely, diametrically, readily, closely, personally, instantly, intimately, bluntly, clearly, outright, expressly, promptly, plainly, strictly, shortly, positively, automatically, openly, actively, quickly, frankly, swiftly, just, independently, quite, entirely, necessarily, completely, totally, primarily, actually, seamlessly, urgently, soon, effectively, either. equivocally, virtually, essentially, fallaciously, deceitfully, inexactly, hypocritically, veeringly, courteously, erroneously, late, verbosely, carelessly, politely, untruthfully, ambiguously, freely, tactfully, inaccurately, long-windedly, insincerely, loosely, basically, wordily, tardily, diplomatically, evasively, circuitously, hereafter, mendaciously, deviously, falsely, slowly, civilly, imprecisely. Directly following the fall a remarkable motion was developed in the bridge itself. It isn't fair to take your fun out of me when you're going to be married directly.